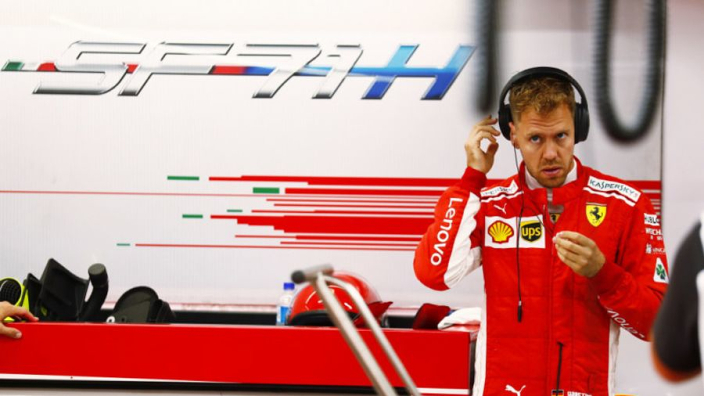 Sebastian Vettel will keep hold of his second-place effort in qualifying for the Brazilian Grand Prix after he was handed a reprimand for destroying the FIA weighbridge during Saturday's action. Vettel was frustrated by the decision to call him in to be weighed during a frantic Q2 and broke the equipment by driving away. Vettel was fined €25,000 after breaking the weighing scale, although it had been suggested that he could be given a grid penalty, or even disqualified from qualifying altogether. He qualified second behind Lewis Hamilton at Interlagos but both drivers' positions were uncertain at the line – Hamilton for blocking Kimi Raikkonen and Sergey Sirotkin and the Ferrari man for his bizarre incident, although both appear to have escaped without serious sanction. Stewards were not quite ready to weigh Vettel, who was in a rush to get soft tyres on and set a time before rain arrived in Q2. Against regulations, Vettel drove onto the scales and then drove away – drivers are supposed to be rolled into and out of position with engines switched off. Vettel gesticulated and shouted in German while the officials dithered somewhat, but it was revealed in the stewards' report that he had turned the engine off after knocking over a cone and edging towards one of the officials at the weighbridge. Maintaining second place on the grid will give Vettel confidence of winning in Sao Paulo for a second year on the bounce. Vettel set his Q2 time on soft tyres, with Hamilton using supersofts, giving the Ferrari man an advantage on the opening stints in Sunday's race. VIDEO: Vettel destroys FIA weighbridge!